Notes: By the end of the nineteenth century Liverpool had become the second port of empire and it had been the main port for the trans-Atlantic passenger trade for over half a century. However in the 1880s the port of Southampton began to take trade away from Liverpool and one of the reasons for this was the passenger railway facilities that had been developed there close to the berths from which the ships sailed. At Liverpool the trans-Atlantic liners used a floating landing stage at Princes Dock close to the Pier Head. All of the major railway termini were located away from this location, and passengers with their luggage transferring between trains and ships had to be transported by road through crowded streets. The Mersey Docks & Harbour Board (MD&HB) did not want to see the passenger liner trade move to Southampton so they decided to build a passenger station adjacent to the Princes Landing Stage. The station, which was named Liverpool Riverside, was opened on 12 June 1895. 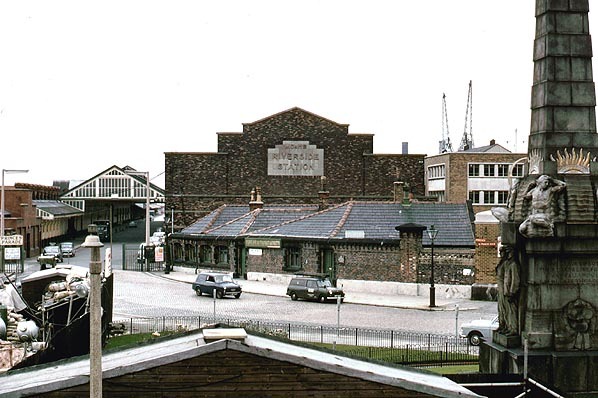 The station was located at the end of a 48-chain branch that connected to the MD&HB ‘main line’ which ran north/south along the length of the docks (in fact a dockside tramway worked at that time by horses). A south-to-east spur was also put in from the MD&HB line to the London & North Western Railway (LNWR) Waterloo Goods station which gave access to a real main line railway that had a fast route to London Euston. The station entrance was a two-storey building that faced south towards the Pier Head. On the ground floor there were booking facilities, waiting rooms and a refreshment room. On the first floor there were offices of the MD&HB. The station platforms stretched from the rear of the building northwards. There were two platforms, one of which was an island, giving three platform faces. All were enclosed under a glazed roof. The platform on the western side of the station had numerous wide doorways that led out to Princes Parade, a roadway that ran parallel to the station. The roadway was also covered by a glazed roof. To the west of Princes Parade were offices, customs facilities and waiting rooms of the shipping companies built on a pier that stood directly above the River Mersey. Covered gangways led from the waiting areas to a floating landing stage at which the liners moored. Passengers could move between ship and train without having to be exposed to the elements at all and luggage could be easily moved. At the north end of the station three tracks merged into two. Within the station the lines were laid in typical railway fashion, rails laid on sleepers sat on stones as ballast. Just beyond the north end of the platforms where the double track section began the line was laid on longitudinal timbers and stone setts were laid along its route up to rail level in tramway style. The rails used were of tramway style (with groove and outer flange) but of a slightly heavier dimension because of the weight they were expected to carry. The type of rail was specially manufactured for the MD&HB whose extensive railway network was laid in this way. At the north end of platform 3 there was a small, non-standard, Railway Signal Company signal box. It was basically a signal box top section, mounted on the platform and was inspected on 7 June 1895. It contained a 7 lever Railway Signal Company Tappet Frame, of the later "Spring Catch" type, all the levers were working. At some stage the lever frame was extended, there was an additional 1 lever frame at the left end and an additional 2 lever frame at the right end, making a final total of 10 levers. The first passenger train used Riverside station on 12 June 1895, an LNWR train from Stafford to Liverpool Riverside including through coaches that had travelled to Stafford from London Euston, attached to another train. The train was run to connect with the sailing of the White Star company liner ‘Germanic’. The MD&HB had intended that Riverside station would be used by all of the main line railway companies which provided passenger services to Liverpool. As well as the LNWR the Great Northern Railway (GNR), the Lancashire & Yorkshire Railway (LYR), the Manchester, Sheffield & Lincolnshire Railway (MS&LR) and the Midland Railway (MR) all ran express passenger services to Liverpool in 1895. The problem was that the MD&HB lines were operated at little more than walking pace. Access to the MD&HB main line for all of the companies except the LNWR was at some considerable distance from Riverside station. The MR, which connected to the MD&HB via the Cheshire Lines Committee line at Brunswick in the south docks, did carry out a trial run. They ran a train along the MD&HB line from Brunswick to Riverside soon after it had opened. It took so long to reach Riverside from Brunswick that the MR dropped the idea of serving the station. This left the LNWR in a monopoly position with regard to train services to Liverpool Riverside. Riverside was not served by timetabled train services in the usual way; instead services were run in conjunction with the arrival and departure of ships and advertised alongside those sailings. Liverpool Riverside became a busy station and a major employer of local people. Hundreds of porters were required to carry the luggage of passengers between trains and ships. The cream of Edwardian society from both sides of the Atlantic passed through Riverside station as did many thousands of emigrants. Because of this the station was kept in immaculate condition by the MD&HB. In the early years mail was handled at Riverside station. Liners on the New York and Liverpool route would typically deposit 2000 or more mail bags. They would be unloaded and after passing through customs they would be carried to the station. On the platform they would be tallied by mail officers and then they would be loaded onto special trains that would carry them to the south. The way in which passenger trains were operated to Liverpool Riverside was dictated by weight restrictions on the swing bridge, the curvature of the track on the MD&HB lines and the steep gradient up Edge Hill through two long tunnels. Two LNWR 0-6-0 tank locomotives were allocated to the task of hauling the trains between Edge Hill and Riverside. They were No.3021 named ‘Liverpool’ and No.3186 named ‘Euston’. They were light enough for the bridge, could handle the sharp curves and had the power to haul the trains uphill to Edge Hill. Some trains were of such a length that both locomotives were required to haul them up to Edge Hill. Between Waterloo Goods station and Liverpool Riverside station the trains moved extremely slowly with an MD&HB employee walking in front with a red flag. It was an interesting feature of the line between Waterloo Goods and Riverside that it threaded through streets and dockside wharves, sharing its route with road vehicles and hundreds of people. The outbreak of the Great War on 4 August 1914 did not at first bring disruption to the Trans-Atlantic passenger trade but after the sinking of the Lusitania on 7 May 1915 there was a downturn which made Riverside station a quieter place but in revenue terms it was more than compensated for by Liverpool being main entry point for imported goods from the Americas. Following the 1916 Easter Rising in Dublin two army divisions were ordered to go to Ireland and Liverpool was chosen as the point of departure. 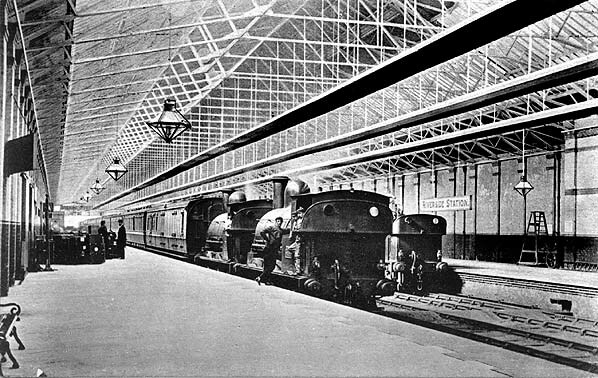 The initial plan was for the LNWR to run troop trains to Liverpool Lime Street and then march the troops to the waterfront. Liverpool had a very large Irish population and the local police recommended that the troop trains be run to Riverside station where the soldiers could be loaded directly onto ships. The running of the trains required special working arrangements along the Riverside branch where additional railway employees had to be deployed. In all 64 troop trains were run. Troop trains were also run in the other direction carrying soldiers who arrived from the various British Empire countries. On 6 April 1917 the United States entered the Great War. During the following months over 844,000 US servicemen and nurses passed through Liverpool, and Riverside station handled a large proportion of them. The LNWR ran 1,684 trains for the US forces. After the war the trans-Atlantic trade picked up again and entered its ‘golden years’. Liners had grown to be ever larger and it took many trains to deal with all of the passengers. On 1 January 1923 the LNWR was merged into the London Midland & Scottish Railway (LMS) which thereafter provided the trains that served Riverside station. In the early 1930s Riverside was being served by an average of eight trains per week. It was not only for the liner trade that trains were run to and from Riverside. Trains also operated to connect with sailings to the Isle of Man especially during the TT Motorcycle Race week. The problem of having to change engines at Edge Hill caused much discussion between the LMS and the MD&HB. The two ex-LNWR tank engines were aging and the LMS would have preferred to be able to run their express locomotives directly to Riverside. Thoughts were given to strengthening the swing bridge and easing the curves but nothing was done before the Second World War broke out on 3 September 1939. During the Second World War Liverpool Riverside station was even busier with troop trains than it had been in the Great War. After the USA entered the war their troops were brought into Great Britain through Liverpool and via Riverside station. During the war period 4,648 special trains ran to and from the station and 1,707,545 soldiers passed through it. After the war thoughts returned to the issue of access to Riverside station by main line locomotives. The main line railways were nationalised as British Railways on 1 January 1948 but Riverside station and the line to Waterloo Goods remained the property of MD&HB. Plans were made to strengthen the swing bridge and ease the curves on the Riverside line by singling it. The works, scheduled for 1950, would require Riverside to be closed for a period. However in October 1949 a ship struck the swing bridge and damaged it, leaving a train and two locomotives stranded in the station. By careful running they were able to pass over the bridge the following day and return to Edge Hill. The MD&HB decided to bring the strengthening works forward. Riverside was out of use until March 1950. When it reopened main line locomotives of British Railways were able to run into Liverpool Riverside for the first time. No change of locomotive at Edge Hill was necessary and the two aging LNWR tank locos were retired. The post-war period was not as busy for Riverside as the 1920s and ‘30s’; nevertheless there were still plenty of trains connecting with sailings. The MD&HB continued maintaining the station in pristine condition. Even the track within the station was kept tidy. On 20 September 1960 British Railways carried out a naming ceremony for two of its main line locomotives at Liverpool Riverside station; these were English Electric type 4 (later to become Class 40) numbers D211 and D212. D211 was named ‘Mauretania’ and D212 ‘Aureol’ after one of ships that had sailed from Liverpool. The English Electric types 4s were used on boat trains that ran to and from Liverpool Riverside. The two locomotives were brought to Riverside coupled together. Upon arrival they were positioned side-by-side for the naming ceremony. D212 was driven by Charles Ebsworth accompanied by fireman George O’Donnell. The growth of airline services in the 1960s resulted in reduced numbers of sailings, therefore fewer trains were required. Also in that decade the change of locomotive at Edge Hill resumed for the first time since October 1949 because the line from Liverpool to London was electrified in stages between 1961 and 1966 and the wires did not extend down the branch to Riverside. By the late 1960s only two companies - Canadian Pacific and Elder Dempster - had scheduled sailings from Liverpool. Riverside station became a popular venue for rail tours during the 1960s. 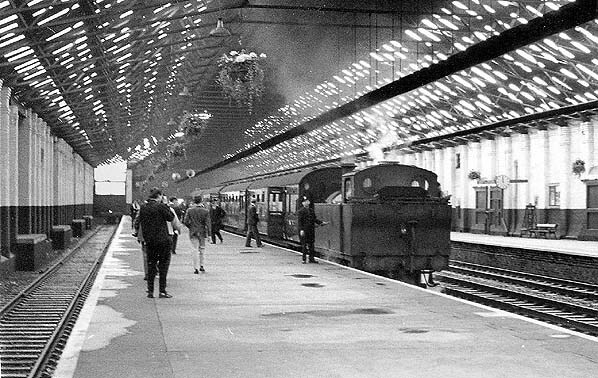 Some such as the LUPTS ‘Liverpool Suburban’ rail tour of 13 June 1964 actually started from and finished at Riverside station. There was even a visit by a DMU as part of the ‘Liverpool Docker’ rail tour on 22 February 1969. By 1970 trains to Riverside were so infrequent that the MD&HB decided to close the station. The very last train to depart was a troop train returning from Northern Ireland leaving Liverpool Riverside on 25 February 1971, appropriately behind a Class 40 locomotive. The lines within the station were lifted shortly after closure but the tramway-style route to Waterloo Goods remained in situ into the 1990s and sections of it could still be seen in 2015. The station building remained in use as waiting rooms and booking offices for the Isle of Man Steam Packet Co until the early 1980s. The trackbed within the station was filled in up to platform level and for many years was used for car parking. The station was demolished in 1990 and the site was redeveloped with modern office blocks in the first decade of the 21st century. 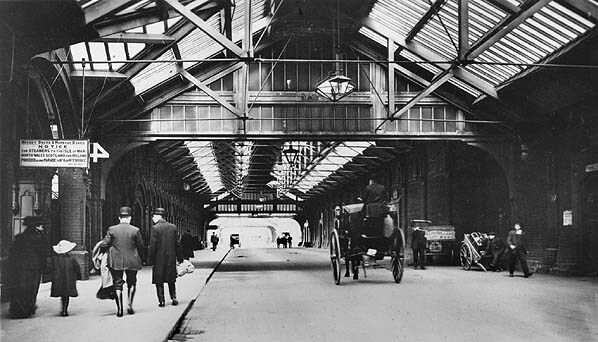 Liverpool Riverside station looking north along platform 1 in 1908. A lengthy LNWR boat train is seen during a quiet period at the station. It had either arrived sometime earlier, and its passengers had departed for the adjacent 'Princes Landing Stage', or the coaches had been brought down from Edge Hill ready for an arriving ocean liner that had not yet docked. Liverpool Riverside station shown on a six-inch scale map from 1908. Liverpool Riverside station shown on a 1948 map. 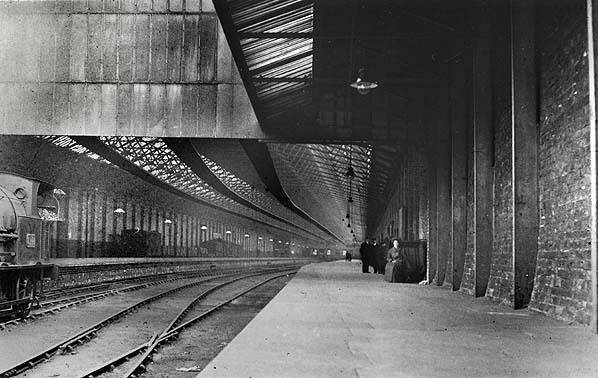 A view looking south along platform 1 at Liverpool Riverside station in 1910. Looking north along Princes Parade in 1911. The platforms of Riverside station are behind the wall to the right. 'The Princes Landing Stage' lies beyond the wall to the left accessed via covered gangways one of which can be seen in the foreground with the number 4. 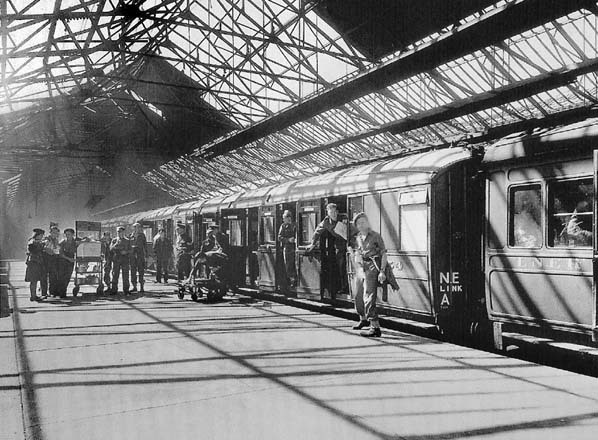 An LNER operated troop train stands at platform 2 of Liverpool Riverside in the summer of 1945. Trains of the LNER would not have been seen at Riverside in peacetime when services had been operated exclusively by the LMS. During the Second World War 4,648 troop trains ran into or out of Riverside. The 'Liverpool Suburban' rail tour prepares to depart from Liverpool Riverside station platform 2 on 13 June 1964. During the 1960s Riverside was a popular destination for rail tours. Although boat train traffic had declined by this time the MD&HB still maintained it in pristine condition. They even provided hanging baskets of flowering plants to make the station more attractive. Liverpool Riverside station looking north from the Pier Head in 1967. 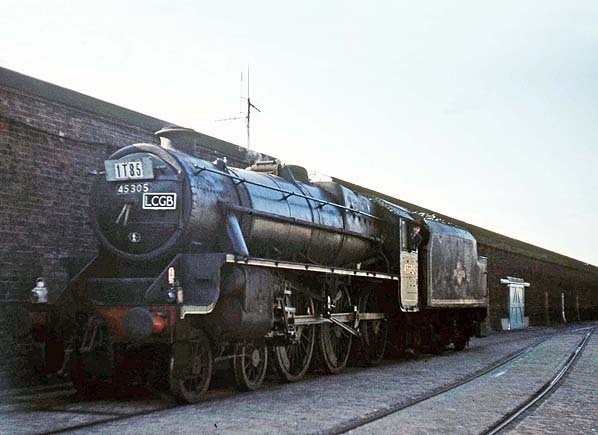 Ex-LMS 4-6-0 5MT (Black 5) locomotive number 45305 of Speke Junction shed is seen at Liverpool Riverside station on 6 April 1968. The locomotive was working the Lancastrian rail tour and in this view looking north it was about to draw onto its train. 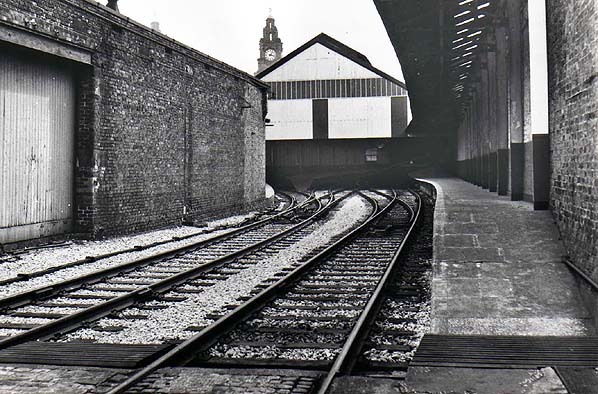 Liverpool Riverside station seen looking south a month after closure in March 1971. To the right is platform 1 which extended beyond the train-shed. It was however provided with a canopy as no expense was spared in order to provide passengers with a comfortable experience. At the bottom of the photograph can be seen the point at which the conventional railway track of the station became a tramway style line typical of the MD&HB system. A view looking north along what would have been platform 1 at Riverside station on 13 August 2012. By this time there had been a reversal in Liverpool's fortunes. 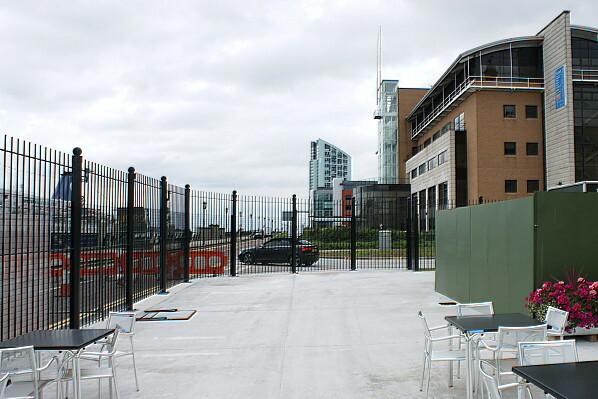 A landing stage (The Liverpool Cruise Liner Terminal) was once again open for business on the site of the Princes stage and a temporary terminal for cruise liner passengers occupied the very site of Riverside stations booking office.